One of the most exciting free things to do in Taupō, we stock Aotearoa’s largest selection of artisan honey products. Be tempted by an amazing array of 100% pure New Zealand and mānuka honey, mead, natural health and wellbeing products and unique gift ideas. Our unforgettable honey experience offers free honey, mead and liqueur tastings, live beehive viewings and fascinating interactive displays. At Café Hive@65, enjoy delicious gourmet ice creams, hot and cold drinks and a great range of divine sweet treats. Every member of our Huka Honey Hive family is passionate about being a voice for the bees and improving their welfare in any way we can. Join us in our mission to save the world, one bee at a time. Our guided tours take you on an exciting exploration of our gardens and our beehives. 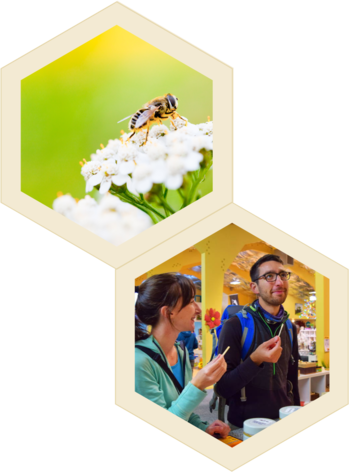 Come and watch our bees busy at work, take part in family-friendly activities, and sample our wide array of premium New Zealand honey-based products. Rich, full and flavorsome, discover the largest range of honey and honey-based products in Aotearoa. Excite the senses with the best of New Zealand honey and mānuka honey. Little though they are, bees are some of the most important – and busiest – creatures on our planet. But our beautiful bees are sadly in decline, and it is our job to help protect them. We use this stamp to represent the fact that we adopt sustainable business practice wherever possible, and we carefully source our huge range of quality products from suppliers who have sustainability as the focus of their business. 8 minutes out of Taupō.